I love Textile Studio Patterns. Their designs are classic, elegant and timeless. Pattern Description: Now you can create those simple and pricey skirts you see in ready-to-wear. This pattern contains 3 pull-on skirts: An a-line, a four gore and a six gore. Fabric Used: Triacetate/poly blend from Fabric Mart. It is a bit heavier than the fabric suggestions but worked perfectly for the formal look I was going for. Suggested Fabrics: Each view has suggestions. I made View B: This 4-panel skirt drops from the hip with a slight flair. Designed for soft draping rayons and lightweight knits. Pattern Size: XS – S – M – L – XL – XXL. The pattern pieces fit together beautifully. The skirt is bit snug at the high hip but that is because of the heavy fabric, not the pattern. Design Changes: I lengthened to floor length. Likes/Dislikes: Love the fabric, wish I had more. The skirt pattern couldn’t have been easier and ran true to size. Tried and True (TNT), One-timer, or Nix This Pattern? TNT. 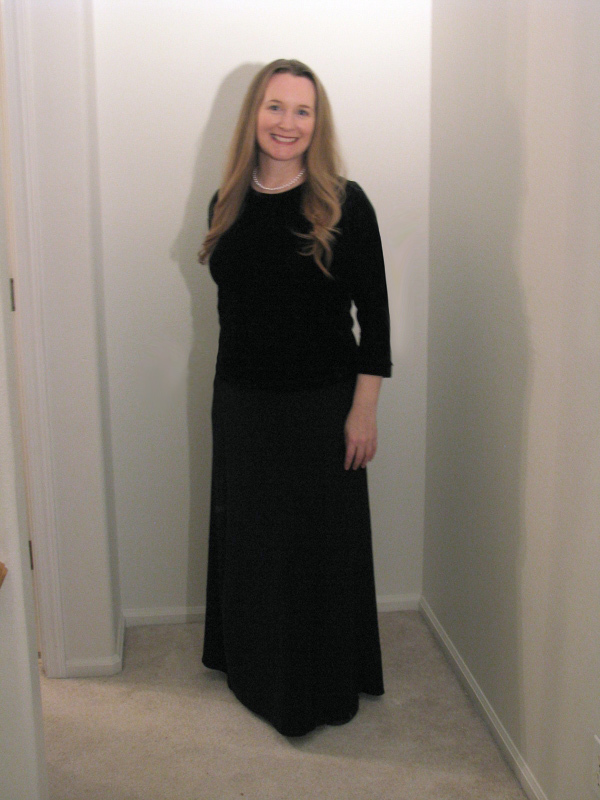 I love this full length and will make some maxi skirts for casual wear. I wish Textile Studio still carried fabrics. I have at least two boxes stuffed full of Marsha’s rayons, wools and knits. I’m only now becoming more and more willing to cut into them. This pattern is no longer available, unfortunately.